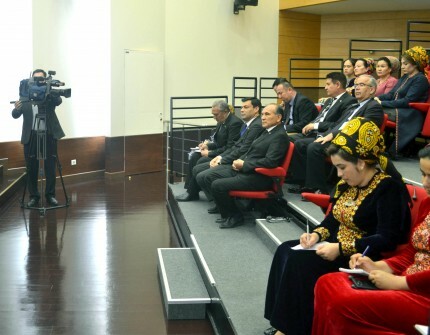 On the 15th of April 2019, the briefing was held in the premises of the Ministry of Foreign Affairs of Turkmenistan dedicated to the external policy course of President of Turkmenistan Gurbanguly Berdimuhamedov in participation of the representatives of national and foreign mass media accredited in Turkmenistan. During the briefing, the representatives of the Ministry of Foreign Affairs of Turkmenistan informed the participants about the external policy course realized by the President of Turkmenistan, as well as the cooperation with foreign states and authoritative international organizations. Special attention was given to the important events of the current week. As is known, on April 15 political consultations between the Ministries of Foreign Affairs of Turkmenistan and France were held in Ashgabat in participation of the State Secretary of the Ministry of Europe and Foreign Affairs of the French Republic Jean-Baptiste Lemoyne, who has arrived to Turkmenistan on a working visit. During the visit, the third session of the Intergovernmental Turkmen-French Commission on Economic Cooperation was held. According to the outcome of the meetings, a number of bilateral documents between Turkmenistan and France were signed. In addition, during the period of April 16-18, the state visit of the President of the Republic of Korea Moon Jae-in will be held in the framework of his tour of the Central Asian countries. The meeting with the Head of State is planned during his visit to Ashgabat. During the negotiations, extensive discussions of bilateral matters of cooperation particularly in trade-economic sphere will be held, as well as the issues pertaining to international agenda. A number of bilateral agreements and memoranda between Turkmenistan and the Republic of Korea will be signed in presence of the Heads of states. During the period of April 16-18, a working visit of the OSCE Secretary General Thomas Greminger will take place in the framework of the events dedicated to the 20th Anniversary of the opening of OSCE Centre in Ashgabat. The meetings with the President of Turkmenistan, Speaker of the Parliament and the Minister of Foreign Affairs will be held.